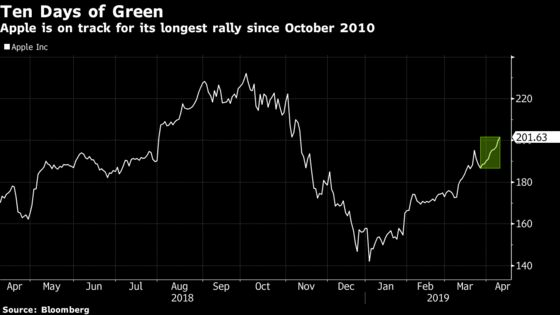 (Bloomberg) -- Apple Inc. shares rose for a tenth straight session on Tuesday, putting the iPhone maker on track for its longest winning streak since October 2010. The stock rose as much as 1.3 percent, suggesting it would close at its highest level since November, with gains of as much as 8.5 percent over the 10-day stretch. Should the rally continue into Wednesday it would make for the longest stretch of gains since a 12-day rally ending in May 2003, according to Bloomberg data. Apple is about 13 percent below record levels, though it has risen more than 40 percent from a January low. The trough was reached after Apple cut its revenue forecast, largely due to weak Chinese demand, though investors have since been moving past the issue. Wedbush on Tuesday raised its price target on Apple by $10 to $225, writing that “demand trends are slowly turning around” in the country, helped by recent price cuts for its iPhone XR product line. Analyst Daniel Ives expects “more significant” cuts ahead, writing that such a move would be “a smart and necessary strategy” given that Apple’s newfound focus on its services business put a premium on the size of its installed user base, rather than unit sales. In another sign of how analysts and investors are looking beyond the iPhone -- a product that was responsible for about 62 percent of Apple’s 2018 revenue, according to data compiled by Bloomberg -- Morgan Stanley on Monday suggested Apple had a massive revenue opportunity in the health-care market, one that could be worth as much as $313 billion by 2027.